Method: For Base: Sieve flour into a bowl. Add butter and sugar. Rub together with fingertips until it all resembles bread crumbs. Press ingredients into a greased Swiss roll tin. Bake at 180°C/350°F for 24 minutes, until golden brown. For Caramel: Melt butter. Mix in Sweetened Condensed Milk and heat for a few minutes. Add sugar and mix. Add Golden Syrup. Bring to the boil slowly, stirring all the time. This takes about 15 minutes. Note: Constant stirring is required to mix the (oily) butter into the other ingredients. I use a hand blender. Boil for 15 minutes, until toffee-like (golden brown). 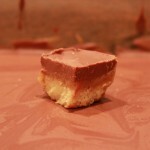 Pour onto the cooled biscuit base and allow to set. 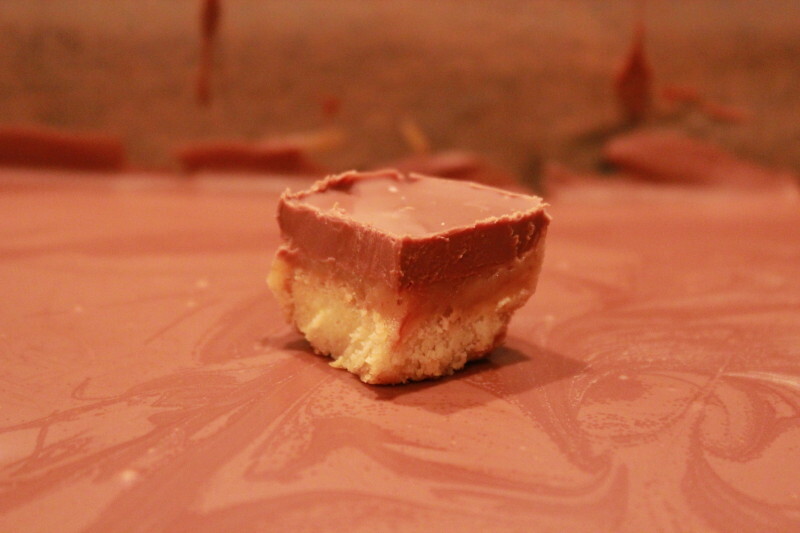 For Top: Melt and spread over SET caramel. When the chocolate is set, cut into squares. Suggestion: Do not be afraid to use more chocolate for a thicker topping.